Everything we do and use daily is already being touched by 3D printing technology, brought to you by SYS Systems UK we discuss the importance of 3D printing technology in the fourth industrial revolution and how 3D printing technology already revolutionises your production processes every day. 3D Printing uses, in a wide spectrum of production processes, varies from business to business but remains defined by three categories- prototyping, manufacture tooling and end-use products. In prototyping and testing product efficiency we are in the early stages of evolving into Industry 4.0 with 23% of prototyping being currently penetrated by 3D printing methods. Many businesses are still relying on conventional week-long processes in the supply chain, through various sourcing outlets. Integration of in-house 3D printing allows businesses to develop design iterations freely allowing flexibility, adaptability and improved end-product performance. Another way in which 3D printing is implemented into the production process is through manufacture tooling- in other words 3D printing allows you to make tools using 3D printed tools. For example 3D printed production line tools, such as injection moulds, can cut tool creation costs by between 10-90% through swapping out conventional methods and replacing them with 3D printing. The benefits of 3D printed production tools begins with the employees as they know the production line through and through so they are able to look at the design/concept using their experience in determining its effectiveness and improve it using 3D printing technology, drastically shortening the time it usually takes to design the tools. This ability to design and produce a new tool per day means significant time reduction alongside considerable cost savings. 3D printing allows complete customisation of production line tools alongside worker input this process allows a new, more innovative way of working. 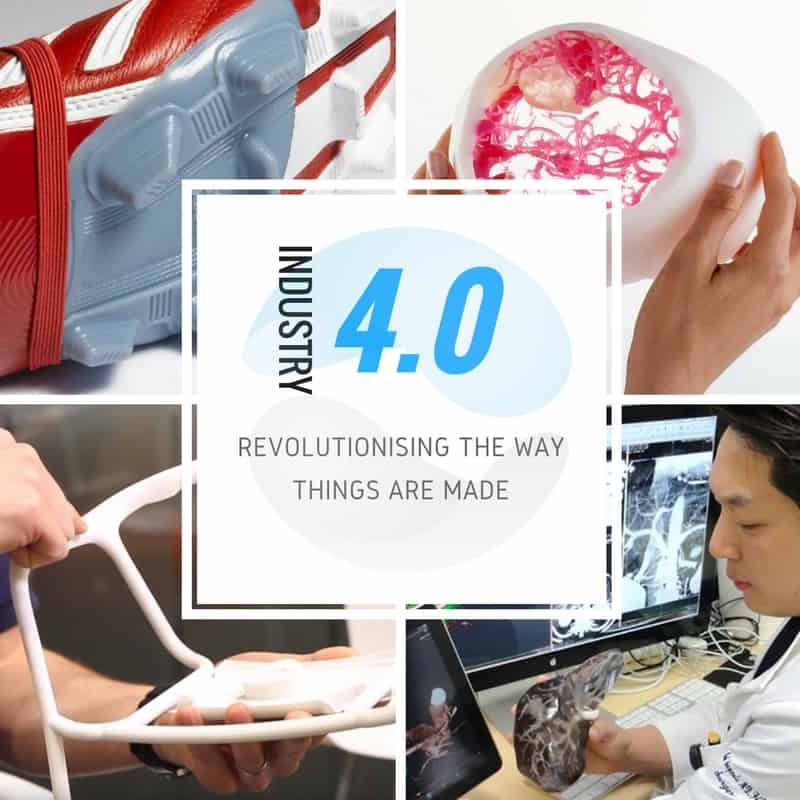 The revolution of 3D printing in Industry 4.0 lies in our third 3D printing use category where our technology is utilised in producing end-use products, which means that the actual product or part is 3D printed and intended to be used as it is. End-use parts such as various consumer goods like NORMAL earphones can be customised due to the nature of their creation. As well as non-flight critical aeroplane components that have been created using Stratasys FDM 3D printing technology using aerospace approve ULTEM thermoplastic materials, which are much lighter than the conventional part material used in aircraft carriers, as well as fire retardant and chemically resistant. Board a plane today and it’s almost a certainty that parts on that aeroplane have been 3D printed. What Does 3D Printing Mean for All Businesses Great & Small? Customisable products are the future of the consumer market. Having the ability to freely produce faster design iterations and adopt varying applications sets your business up to be completely adaptable to consumer and industry demand, allowing for your business to adopt the ever-changing needs and desires of the world. Businesses live or die dependent on their ability to react to the market fast enough, keeping up with your market is an important factor in your success and to move into Industry 4.0 businesses of all sizes need to consider the benefits of rapid prototyping in production tooling and the manufacturing of end-use products. Another field in which customised products have been hugely beneficial is the medical sector. Many patients quality of life has been improved through advances in 3D printing technology. Through the ability to prototype organs in materials that mimic human tissue, doctors have been able to plan and prepare for complex operations using a 3D printed exact copy of the patients condition. One of the most important aspects of Industry 4.0 is influencing the youth of today to create a more advanced future. Using STEM subjects we can inspire and excite the younger generations to prepare and train them with the skills they will need in the future. This new Industry 4.0 requires a specific set of skills called STEM- Science, Technology, Engineering and Mathematics. These are the key skills required for work of the future where flexibility and rapid design, as well as the ability to utilise data is imperative. With not enough qualified people coming through school and university with a STEM education, countries and societies have a duty, in order to evolve, to implement and encourage hands-on STEM learning. More importantly it is time for society to realise that the future is not just about hardware and hardware alone, how can a machine benefit you if you do not possess the skills to use it? The most important way to transition into the fourth revolution successfully is by gaining the knowledge needed for the technologies and innovations of the future. Those societies, cities, countries, Government and cultures that fill that lack of skills and embrace STEM learning will most likely be the most successful in Industry 4.0.